The beautiful finish of these .308 cartridges gives some insight into the tight quality control and spectacular manufacturing protocols that exist in the Sellier & Bellot facilities. 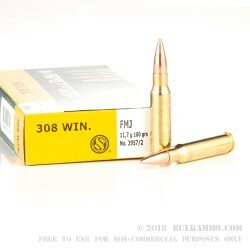 The 180 grain projectile is a full metal jacket bullet that offers excellent penetration, weight retention and total energy delivery for the .308 and is well suited to larger game or for densely forested areas where the knock down power of the high grain weight will be put to best use. Nice velocity and energy allow this larger projectile to still be effective where a speedier bullet makes sense. The Boxer primed brass cartridge casing makes this an easily reloadable cartridge and the Sellier & Bellot offerings are famous for being spartan, but modern, this reloadability gives it a value-added position. The price point is high for general use ammunition, but it performs well above average on the points that matter, including the accuracy that is well within the 1MOA region. The serious attention to detail is a huge benefit to those who would employ this cartridge in their firearms. 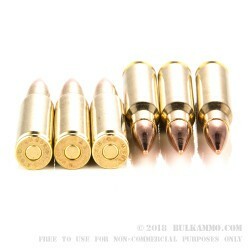 Feeding and function are top tier and the brass quality is also one of the best options available for serious reloaders. When you order this, you’ll get a single box with 20 rounds ready to fire. Want to stock-up? 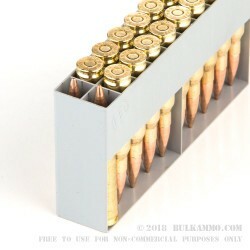 Pick up the bulk 1000 round case of this same .308 ammo for sale here. Great for bolt-action and short-piston autos. Not for M1A - S&B uses slower-burning powders - which can cause op-rod to bend. The slowest powder for M1As is IMR-4064. I did shoot this in an M21 - and was quite accurate - but I contacted S&B to ask them what type of powder they used - and it is slow-burning powder - a NO-NO for M1As - especially the $2800 M21 !